Hi, my name is Mary. I am from México city and I´ve been teaching English to children and adults for over 25 years and it´s one of the passions of my life. I love being part of this community since 2010. HELLO! PRACTICE SO, TOO, EITHER, NEITHER, BUT- WITH THESE FILL- IN EXERCISES AND ROLE PLAY WITH YOUR STUDENTS SO THEY AGREE OR DISAGREE WITH EACH OTHER! THANK YOU VERY MUCH TO ALL THE PEOPLE WHO DOWNLOADED MY LAST WS.ON POLITE QUESTIONS! HUGS! 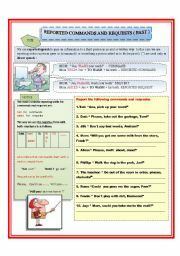 This ws.helps students to be polite when asking and answering questions in different situations using reported speech. Students can role-play different situations once they can use the structure properly. Have a nice weekend, everybody! CONCEPT AND STRUCTURE EXPLANATION (AFF. AND NEG.) AND 3 EXERCISES WITH KEY TO PRACTICE REPORTED COMMANDS AND REQUESTS. HAVE A NICE DAY! THIS WS. IS A COMPLEMENT FOR THE PICTURE DICTIONARY- AT THE MALL, SO YOU LEARN HOW TO HANDLE A CONVERSATION WITH A SALES PERSON. 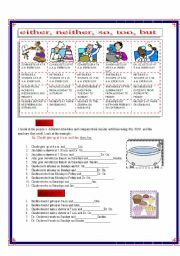 IT INCLUDES A SAMPLE CONVERSATION, VOCABULARY AND A FILL-IN EXERCISE TO PRACTICE THE DIALOGUE. SS. CAN ROLE- PLAY AFTERWARDS.HOPE YOU FIND IT USEFUL! HUGS! Differentiating verb tense structures and concepts is very important for learners of English as a second language so they can use them correctly! They will also check if the time expression used in each sentence is correct.It´s an excellent exercise for class or exam. I hope you like it! SHOPPING FOR CLOTHES IN AN ENGLISH SPEAKING COUNTRY MAY BE NERVE-WRECKING IF YOU DON´T KNOW THE PROPER VOCABULARY! HERE, I TRIED TO MENTION ITEMS THAT PEOPLE GENERALLY LOOK FOR. TO COMPLEMENT IT I ADDED A SURVIVAL WORSHEET! HOPE IT´S USEFUL! HUGS! 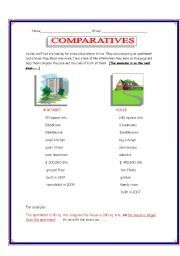 STUDENTS WILL BE ABLE TO PRACTICE THE COMPARATIVE FORM OF 1 OR MORE SYLLABLE ADJECTIVES WITH THIS WS. THERE´S AN EXERCISE RELATED TO THE IMAGES AND "KEY INCLUDED". THANK YOU VERY MUCH TO ALL THE DEAR TEACHERS WHO HAVE DOWNLOADED MY PREVIOUS WS! AND THANK YOU VERY MUCH FOR ALL THE WONDERFUL WS. THAT YOU HAVE UPLOADED! HAVE A NICE WEEK! THIS WS. 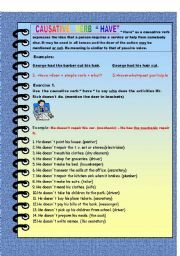 WILL HELP INTERMEDIATE-ADVANCED STUDENTS DEDUCT SENTENCES IN PRESENT PERFECT. IT CONTAINS 3 EXERCISES. 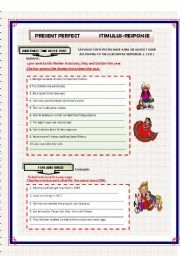 ONE FOR EACH CONCEPT USED IN PRESENT PERFECT. THERE MAY BE DIFFERENT ANSWERS ACCORDING TO THE STUDENTS´ CREATIVITY. I LOVE YOU,PHILIP MARTIN,FOR YOUR BEAUTIFUL CLIPART AND YOUR KINDNESS! LOVE TO ALL OF YOU! 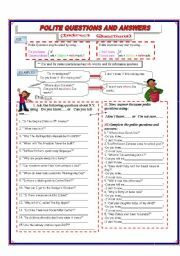 This is an exciting exercise to integrate and practice basic verb tenses: verb to be (present and past), present continuous, simple present, simple past, past continuous, idiomatic future and simple future. Students may answer one at a time or teacher may ask students to do it individually. It may also be used as a test.